The debate over the potential harms and benefits of vaping has raged on for years. But the results of a large trial in the UK have provided the pro-vaping side its biggest win yet. It found that people trying to quit smoking were almost twice as likely to succeed over a year’s time if they used electronic cigarettes compared to people who stuck to typical nicotine replacement therapy. The study, published in the New England Journal of Medicine on Wednesday, recruited nearly 900 smokers in the UK. All of the smokers had gone to dedicated centers to help them quit. There, they were randomly assigned one of two interventions. One group was handed a three-month supply of a standard cessation treatment of their choosing, such as nicotine gum, patches, or lozenges. The other was given an e-cigarette starter kit, complete with a few bottles of e-juice, and those people were encouraged to keep vaping. Both groups were also given at least a month’s worth of weekly counseling sessions. To objectively measure their progress, they also had their breathing levels of carbon monoxide (a common toxin in cigarette smoke that lingers in exhaled air) monitored. By the one- and four-week point, people given e-cigarettes were less likely to feel a severe urge to smoke. They also felt less irritated or unable to focus a week into their quitting attempt. And most importantly, at every point of the study, these users were more likely to have abstained completely from smoking cigarettes. By the 52nd week, 18 percent of the e-cigarette group was still off cigarettes, compared to 9.9 percent of the standard treatment group. That might not seem like a huge success rate, but it’s notoriously difficult to quit smoking. Even the success rate using nicotine replacement therapy seen in this study is actually pretty high compared to other studies measuring its effectiveness. The e-cigarette users were also more likely to cut down their smoking by 50 percent or more, even if they didn’t quit entirely. “This is a well-designed and much-needed study that may have important clinical and policy implications for the use of e-cigarettes as a cessation aid,” Scott Weaver, an epidemiologist at Georgia State University’s School of Public Health who is not affiliated with the new research, told Gizmodo. Previous trials and studies have tried to figure out just how well e-cigarettes can help smokers quit. But some studies (including one by Weaver) have shown no real benefit compared to other cessation options. According to the authors, though, theirs is the first clinical trial to test out modern-day e-cigarettes in people actively trying to quit. These devices now often have more nicotine and come in a more convenient form than the first-generation vaping devices. “Something people often don’t recognize is how vaping products have become much better substitutes for cigarettes over time. So the results are not that all surprising,” David Levy, a professor of oncology at Georgetown University Medical Center unaffiliated with the research, told Gizmodo. Another important consideration, according to Sven-Eric Jordt, an anesthesiologist, pharmacologist, and cancer biologist at Duke University who has studied the potential health risks of vaping, is how these patients were treated. For example, Weaver said, most smokers here don’t vape every day, or they vape while still smoking regularly. 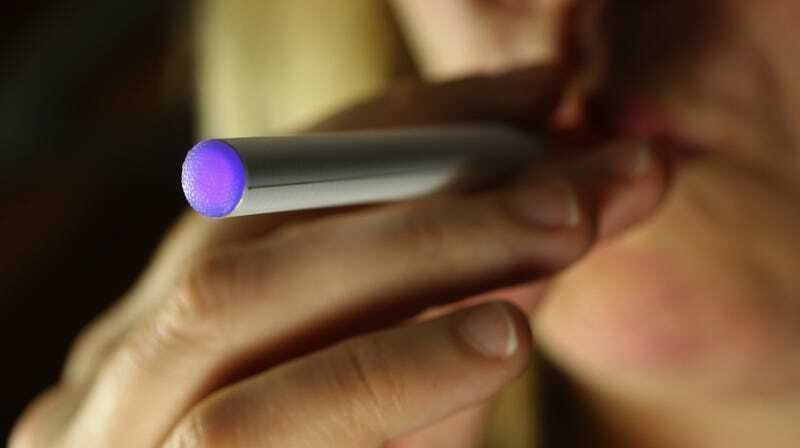 The culture in the UK surrounding smoking and e-cigarettes is also different from the U.S. The UK, for one, has already been pretty welcoming to the idea of e-cigarette use as a cessation tool. In 2015, the government’s public health agency, Public Health England, endorsed an independent report that found e-cigarettes were significantly less harmful than tobacco cigarettes and should be embraced as a way to help smokers quit. And they’re similarly on board with the latest findings. But Jordt noted that newer devices like the Juul pod have only recently arrived in the UK. These devices have up to three times more nicotine than the devices used in the clinical trial. Juul’s rapid popularity among teens in the U.S.—which has sparked fears that it could lead more young people to pick up tobacco smoking and reverse the success we’ve seen with lowering teen smoking rates—might explain the more reluctant attitude of doctors in the U.S. to enthusiastically embrace e-cigarettes as a cessation aid. While some research (including by Levy) has cast doubt on the idea that teen vaping will cause more teen smoking, agencies like the Food and Drug Administration are pushing policies that will restrict flavored e-cigarettes from being widely available in stores or online. Some states, including Vermont, are even floating bills to ban the sale of flavored products altogether. Another concern Jordt has about e-cigarettes is that many users will simply never stop using them. Even in the current study, roughly 80 percent of people were still regularly vaping by the end of the year. Ideally, you’d want people to wean themselves off the nicotine and the potentially harmful toxins provided by e-cigarettes. But it very well might be a price worth paying. “It’s a concern. But the people who switch, they’re still likely to have lower health risks,” said Levy. Despite the impressive findings, Levy and the other experts Gizmodo spoke to said more research is still needed in the U.S. and elsewhere, using newer devices, before doctors here can wholeheartedly support vaping as a superior cessation aid over the standard treatment (likely with regular counseling to boot). Can You Vape to Death?